An unlicensed 16-year-old driver who was pulling out of the Paso Robles High School parking lot on Wednesday, crashed into a 17-year-old girl, according to the city’s police department. The victim suffered critical injuries and remains hospitalized. Around 12:40 p.m., the 17-year-old girl was walking on the sidewalk with her friend when she was struck by a GMC Yukon that was trying to turn onto Niblick Road, according to witness statements to police. 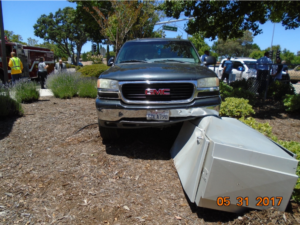 After striking the girl, the SUV drove over the sidewalk and into a garden area where it ultimately crashed into a utility control box, a Paso Robles police news release states. Paramedics arrived at the scene and delivered first aid before transporting the girl in an ambulance to Twin Cities Community Hospital in Templeton. Police say neither drugs nor alcohol appear to be factors in the collision. The police department press release made no mention of an arrest or citation. An investigation into the crash is ongoing. PG&E workers and Paso Robles Unified School District personnel are assisting with the investigation. Whoever provided access to the keys or the car, should be charged with a crime along with the driver of the car. In addition, they should be held 100% responsible for any and all restitution, including medial costs, and any other collateral damage caused by the stupidity of those culpable. I’m trying to figure this out. Like, were his parents out of town so he thought he’d pull a fast one? Were the parents indisposed or too lazy so they let him drive himself? Did his parents know that he was driving? Did he drive all the time? I mean, that vehicle is a V8 quite a bit of power for someone who doesn’t know how what they’re doing. The boys mother knowingly let him use her car. He of course was not an insured driver. It is very doubtful the victim will be able to get any money from insurance. Will this boys mother be able to pay all of her medical bills? Doubtful. How will there be any sort of justice for this poor girl? Was this unlicensed driver driving his parent’s vehicle? Did he have a permit and was with an adult or ???? Why was this kid behind the wheel? And why did his parents let him have the keys? Like many they don’t know the word “NO”. Maybe a friend who was licensed owned the car and let him drive? Perhaps…and if so, he/she should be held responsible.